The Denon D-M40DAB is now discontinued. The replacement Denon D-M41DAB HiFi system has many of the same features, but now with Bluetooth. Small hi-fi systems like the D-M40DAB have been available from Japanese manufacturer Denon for some time. The latest model succeeds the D-M39 which itself was popular and picked up a number of awards. Large buttons are used to make operation easier and a two line display makes it possible to see what track is playing or read text associated with the current radio station. Although the Denon D-M40DAB does not have Bluetooth, there are two optical audio inputs on the back. These can be used to connect up something with optical outputs, like some Freeview HD televisions or other digital equipment. The rear of the unit sports a F-plug connection, making it possible to connect an outside FM/DAB aerial if your home or apartment has one. A single pair of phono (RCA) inputs is also provided. Here you could connect up a turntable (as long as it has a phono stage) or use a Chromecast Audio to add streaming audio options. The USB port on the front of the system supports MP3 and WMA files, as well as FLAC, WAV and AAC. Having the ability to play back lossless audio files might make it easier to leave the CDs in their cases for some owners. When iOS devices are plugged in they are charged by the hi-fi, even when in standby mode. 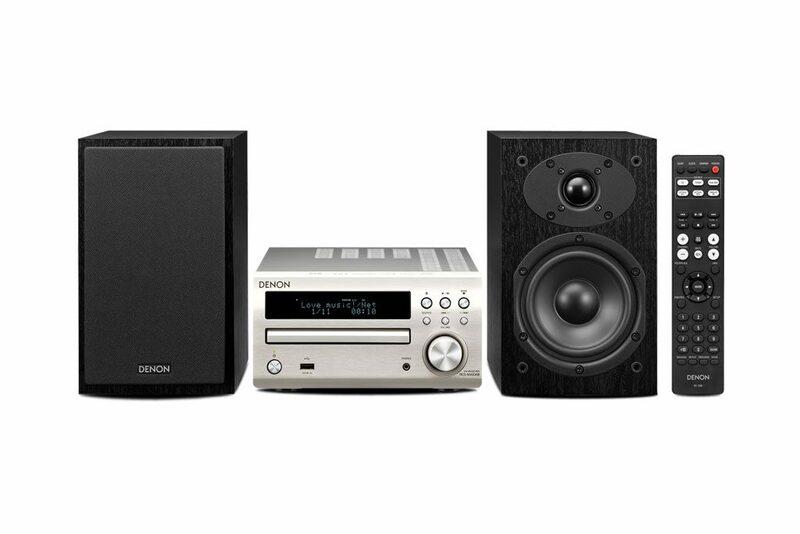 The Denon D-M40DAB can be purchased as a micro system with Denon speakers or as a standalone unit. The latter option is better for users who already have bookshelf-type speakers which don’t need replacing. Two colours are available for the unit – black and premium silver. The speakers can be chosen in black or cherry wood. There is a version of the system which does not include DAB. UK retailers should be stocking the correct unit, but if DAB is not mentioned it is well worth asking. Verdict: Denon's latest compact hi-fi is a worthy successor to the D-M39. There are more affordable systems with Bluetooth and extra inputs, but this receiver has been well received when it comes to sound quality.